MEQUON, WI--(Marketwire - October 25, 2010) - Mortgagebot® LLC (www.Mortgagebot.com), the leader in online lending solutions for banks and credit unions since 1997, announces a breakthrough in consumer convenience -- and the new standard in "on-the-go" mortgage shopping: PowerSite® Mobile. Now the nearly 1,000 financial institutions nationwide that use Mortgagebot PowerSite as their mortgage point-of-sale platform are providing mobile mortgage shoppers with the industry's most user-friendly shopping experience -- and they're doing it automatically, with no extra cost and no new software or programming. PowerSite Mobile is the new online solution that enables mortgage lenders to deliver fast, real-time product selection and pricing to the millions of consumers who use mobile devices -- such as the iPhone, Blackberry, and iPod Touch. "In today's world, over 70 percent of consumers start their mortgage searches online," said Scott Happ, President and CEO of Mortgagebot, "and 77 percent of consumers go online for rate-and-fee quotes. In addition, by 2013, an estimated one billion mobile devices will be connected to the Internet -- so it's vital that mortgage originators embrace mobile, online lending." According to Happ, PowerSite Mobile is the latest example of Mortgagebot working to fulfill its mission to provide its bank and credit union clients with the technology they need to compete. "Literally overnight," Happ noted, "Mortgagebot has enabled its nearly 1,000 financial institution clients to provide users of mobile devices with a solution that truly makes mobile mortgage shopping fast, easy, and satisfying." Until now, the mortgage industry has faced a significant gap in meeting consumer expectations. That's because mobile mortgage shoppers have traditionally been forced to use miniaturized versions of lenders' regular Web sites -- which are hard to read and hard to navigate on mobile devices. "There's a reason why most consumers don't use their mobile devices for mortgage shopping," said Happ. "Most lenders' Web sites are simply too difficult to navigate from a smartphone -- which makes getting a mortgage quote almost impossible for today's on-the-go mortgage shopper." Now, when consumers use a mobile device to get online mortgage quotes from a lender that uses Mortgagebot PowerSite, they are transparently given immediate access to an easy-to-navigate, mobile optimized version of the lender's mortgage shopping Web page. PowerSite Mobile enables lenders to instantly deliver what mortgage shoppers want: real-time, accurate, personalized rate-and-fee quotes. And consumers have to enter only eight pieces of non-personal data. The system even saves the data so shoppers don't have to re-enter information on subsequent visits. "PowerSite Mobile helps lenders meet consumer expectations," said Happ. "It's easy to use, it's accurate, and it's readily accessible from any mobile device. In addition, it helps increase a lender's brand awareness, which drives more borrowers to the lender's mortgage Web site." "Ultimately," Happ noted, "PowerSite Mobile enables lenders to better serve borrowers, compete more effectively, and grow their loan volume." Enables "on-the-go" mortgage shopping. PowerSite Mobile is a mobile-optimized version of Mortgagebot's PowerSite Consumer solution for online lending; upon detecting a mobile browser, it automatically provides consumers with easy-to-use, mobile-specific mortgage-shopping capabilities. Provides detailed mortgage quotes. PowerSite Mobile instantly delivers detailed, accurate, real-time quotes to consumers -- including a convenient link to the lender's "smart," interactive, online mortgage application. Helps lenders boost volume. PowerSite Mobile maximizes awareness of a lender's rates -- which drives traffic to the lender's Web site, attracts new borrowers, and helps increase the lender's application volume. At the core of PowerSite Mobile is Mortgagebot's proprietary product and pricing engine, which uses sophisticated product eligibility filters to provide real-time, personalized mortgage quotes that include accurate, itemized closing fees down to the city level. This centralized database -- shared by all of Mortgagebot's nearly 1,000 clients -- contains the details of 30,000 different loan programs. Collectively, Mortgagebot's product and pricing engine has performed over 40 million rate searches year-to-date, making Mortgagebot the market leader in delivering highly accurate mortgage quotes to consumers. As PowerSite Mobile searches, it evaluates the consumer's data against the lender's unique business rules -- and creates a complete list of mortgage products for which the consumer is eligible. PowerSite Mobile then displays its quotes on a mobile optimized screen that shows interest rate, points, APR, closing fees, and monthly payment for every eligible product. But unlike most mortgage shopping tools, PowerSite Mobile gathers rates and fees in real time from the lender's live product database -- which means all quotes are completely accurate when presented. In fact, the data display reflects exactly what the lender would show on a Good Faith Estimate (GFE) if the consumer were to submit an online application. The "Details" link to the right of each quote opens a page that instantly displays an accurate, detailed closing fee breakdown, an estimate of the cash required at closing, and a complete payment stream disclosure for the loan. "Accuracy is especially important in light of the government's recently mandated changes to mortgage disclosures," explained Happ. "The new RESPA regulations hold lenders accountable for the fees listed in a GFE; and the information delivered by PowerSite Mobile fully satisfies those stringent requirements." While mobile devices are popular for their convenience, their small screens mean that consumers are unlikely to use them to complete an entire mortgage application. So Mortgagebot has enabled PowerSite Mobile to seamlessly transfer consumer quote data to a desktop or laptop computer. When ready to apply, the consumer can click on the "E-mail Results" button and enter an e-mail address. PowerSite Mobile instantly sends the consumer a reminder e-mail that includes the quote details and a link to the selected lender's "smart," online application. Clicking the link takes borrowers directly to the lender's mortgage application Web site, where they can complete an interactive, "smart" mortgage application; obtain immediate, conditional online approval; and receive all government mandated disclosures -- and do it all in about 20 minutes. "PowerSite Mobile is a breakthrough in consumer convenience," observed Happ. "Now, whether mortgage shoppers are at the beach, in the backyard, or at the kids' soccer game, they can instantly get accurate rate-and-fee quotes from our nearly 1,000 bank and credit union clients. 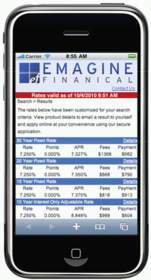 No other mortgage shopping tool gives mobile consumers this kind of convenience and accuracy." Mortgagebot LLC (www.Mortgagebot.com) is the industry-leading Inc. 5000 company that provides the award-winning PowerSite family of integrated point-of-sale (IPOS) solutions for automating the application, pricing, approval, and disclosure process in every mortgage business channel: Web site, branch, call center, or loan officer. Mortgagebot blends deep mortgage experience with innovative "cloud computing" technology to create scalable and affordable Web sites for nearly 1,000 banks and credit unions nationwide. Lenders large and small view PowerSite as a "must-have" solution because it helps them deliver a superior borrower experience, increase their loan volume, and compete more effectively. In addition, PowerSite is flexible, easy to use, and features a rapid and proven implementation process. Mortgagebot also offers Mortgage Marvel® (www.MortgageMarvel.com), the award-winning mortgage shopping service that delivers accurate, anonymous, real-time rate quotes in seconds from a selection of hundreds of lenders. But unlike other mortgage shopping services, Mortgage Marvel enables borrowers to link directly to their preferred lender -- where they can complete a mortgage application and get pre-approved with full disclosures, all in about 20 minutes. Mortgagebot, Mortgagebot PowerSite, and Mortgage Marvel are registered trademarks of Mortgagebot LLC. Mortgagebot's PowerSite Mobile solution gathers mortgage rates and fees in real time from a participating lender's live product database, and presents accurate mortgage quotes that are optimized for display on mobile devices.